Superb steam locomotive action in the most scenic parts of the United States and other locations of the world. The Goodheart tradition continues after his untimely death with new releases. Professionally photographed and produced locally in the Republic of South Africa by Vidrail, this new program reviews steam locomotion from its inception in the country in the 1800s to present electric and diesel power. Some early steam coverage is via still photos only. Much like the USA, South African railways evolved locally and regionally and had different gauges to start. Over time, organizational and government consolidation circa 1910 resulted in SAR (South African Railways), currently Transnet. Action sequences are both video and archival movie film. 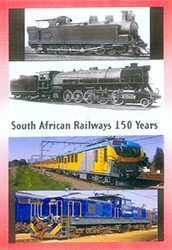 This is a comprehensive survey of the history of South African railway operations. Includes some imagery from countries bordering the Republic of South Africa as well. Perfect for the enthusiast who is interested in history as well as runby action. An excellent companion to the book published by VidRail covering the same topic. © Copyright Goodheart Productions, All Rights Reserved • Site by Soapbox Studio, Inc.